I grew up with Norman Wisdom, who has died, aged 95. His films seemed to be on an endless loop on TV when I was a kid; they formed part of my comedy education, alongside the Carry Ons, the Doctor films and various other gentle oddities like Nearly A Nasty Accident, What A Whopper and The Iron Maiden. 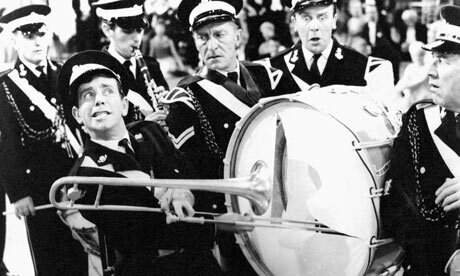 Outside of the Keystone Cops and all the old Mack Sennett/Hal Roach silents and two-reelers which were also on telly all the time, I pretty much grew up thinking that Britain was the centre of the comedy universe. And in the 50s and 60s, it pretty much was. (I actually made no distinction at the time between old and new, American and British, black and white and colour – hey, everything was in black and white in our house until about 1973 anyway – if it was a film and it was a comedy and it was on telly, me and my brother Simon were there.) If I had comedy heroes in my childhood, they would have been Abbott and Costello, Laurel and Hardy, Sid James, Kenneth Connor and Norman Wisdom. All dead now, of course. But still alive. If you look them up, there are about a dozen classic, mainly job-based Wisdom comedies in black and white, from 1953’s definitive Trouble In Store (the one in a shop) to The Early Bird in 1965 (the one on the milk round). I remember seeing Michael Bentine’s The Sandwich Man on TV, a sort of loose comedy compendium made in colour in 1966, in which Wisdom plays a boxer, and it felt a bit weird. Weird to see him in colour, and weird to see him playing a small part. Also, it seemed such a melancholy film, out of sync with the merry world of Wisdom, in which slapstick mayhem was never far around the next corner. Norman played the fool, with his ill-fitting, half-mast demob suit and pulled-down cap, always on the verge of hysterical laughter, or so it seemed, but capable, like all the best clowns, of conveying almost heartbreaking melancholy. I’ll be honest, as a kid, I found those bits harder to take. I preferred it when he was falling over, or into things, or off things, or leading a brass band down a blind alley, or rounding up an entire police force with his father’s police whistle, or just bringing chaos into the life of Jerry Desmonde (who was already dead by the time I saw him – he passed away in 1967). Once I came of age, and discovered Spike Milligan and Monty Python and Mad magazine, I put the innocent silliness of Wisdom behind me, but he made an indelible impression on my young soul. I’m sad that he’s gone, although he lived a long life, loved and even worshipped as a God for most of it. He was pratfalling to very near the end. That might have seemed desperate or tragic in others, but not him, oddly. I was privileged to be in the same room as Norman in around 1993, I think, when Stuart and I were invited to a light entertainment reception at the BBC on the back of our first Radio 5 comedy series, and felt very much like interlopers or competition winners. We were in awe of the big stars who attended in the Council Chambers, which seemed impossibly grand – I mean the likes of Wogan, Parsons, Jacobs – but it was Wisdom who made the biggest impact. He will have been a sprightly 78 then, but it was still a delight to see him take the tray from a waiter and prance around, giggling, serving us all drinks. What a treat. Gawd bless him. And if you have kids, show them On The Beat or Trouble In Store, made over half a century ago, and see if they laugh. I hope they do.